Sound and vibration perception are always coupled in live music experience. Just think of a rock concert or hearing (and feeling) a church organ sitting on a wooden pew. Even in classical concerts kettle drum and double bass are sensed not only with our ears. The air-borne sound causes seat vibrations or excites the skin surface directly. For some instruments (e.g. an organ) structure-borne sound is transmitted directly from the instrument to the listener. 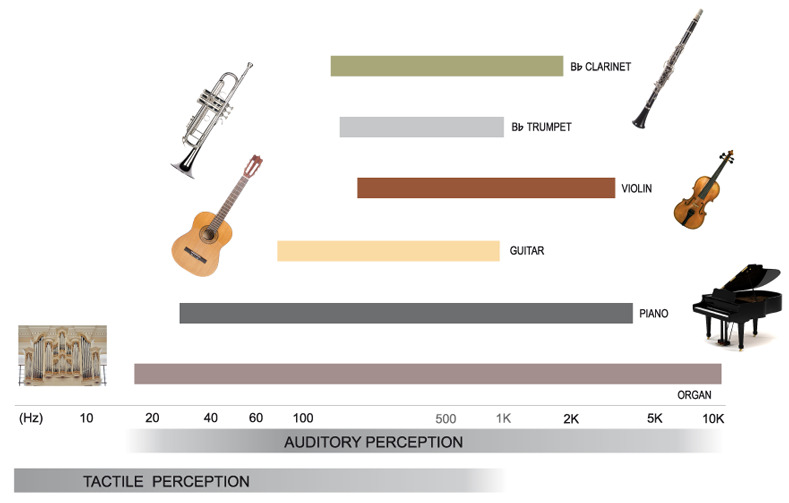 As can be seen in the picture below: the frequency ranges of auditory and tactile perception overlap. Additionally the fundamental frequency ranges are illustrated for some instruments, which can excite sound and vibrations. If concert recordings are played back with multimedia hi-fi systems at home, the vibratory information is missing in the majority of cases. This is due to low reproduction levels or to the limited frequency range of conventional loudspeakers. The audio signal on todays DVDs contains an additional channel for low frequency effects (LFE), which is intended for reproduction using a subwoofer. The generation of tactile components is still very restricted. An enhancement of such a systems might be possible using an electrodynamical shaker which generates whole body vibration (WBV) for a seated person. Different systems implementing this approach are developed and evaluated. 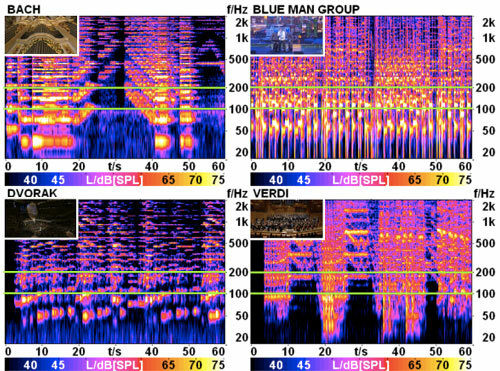 The generation of a vibrotactile signal from different exemplary audio signals is analyzed. Different parameters during this process are examined in relation to their perceptual consequences using psychophysical experiments. In general: Vibrations can have a positiv effect on the perception of music. In addition, they can increase the perceived loudness. Want to know more? 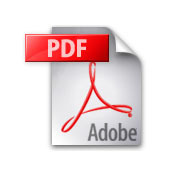 A detailed discussion and experimental data can be found in the following publications. Merchel, S. and Altinsoy, M.E. (2008) 5.1 oder 5.2 Surround - Ist Surround taktil erweiterbar?, in Proceedings of the DAGA 2008 - 34th German Annual Conference on Acoustics, 2008, Dresden, Germany. Merchel, S. & Altinsoy, M.E. (2009). Vibratory and Acoustical Factors in Multimodal Reproduction of Concert DVDs, in Altinsoy, M. E., Jekosch, U. & Brewster, S. (Eds. ), Haptic and Audio Interaction Design 2009, LNCS 5763, Berlin, Germany: Springer. Altinsoy, M.E. & Merchel, S. (2010). Cross-Modal Frequency Matching: Sound and Whole-Body Vibration, in Nordahl, R.; Serafin, S.; Fontana, F.; Brewster, S. (Eds. ), Haptic and Audio Interaction Design 2010, LNCS 6306, Berlin, Germany: Springer. Altinsoy, M.E. & Merchel, S. (2011). BRTF (Body Related Transfer Function) and Whole-Body Vibration Reproduction Systems, AES 130th Convention, London, UK. Merchel, S. & Altinsoy, M.E. (2013). Auditory-Tactile Music Perception, in Proceedings of 21st International Congress on Acoustics, ICA 2013, Montréal, Canada. Merchel, S. & Altinsoy, M.E. (2013). Der Einfluss von Vibrationen auf die Konzertwahrnehmung, in Proceedings of the AIA-DAGA 2013, Merano, Italy. Merchel, S., Caspari A. & Altinsoy, M.E. (2014). Der Einfluss von Vibrationen auf den bevorzugten Basspegel bei der Musikdarbietung, in Proceedings of the DAGA 2014 - 40th German Annual Conference on Acoustics, Oldenburg, Germany. Merchel, S., Caspari A. & Altinsoy, M.E. (2014). The influence of vibrations on the preferred bass equalization in an audio system, in Proceedings of the EAA Forum Acusticum 2014, Kraków, Poland. Merchel, S. and Altinsoy, M.E. (2014). 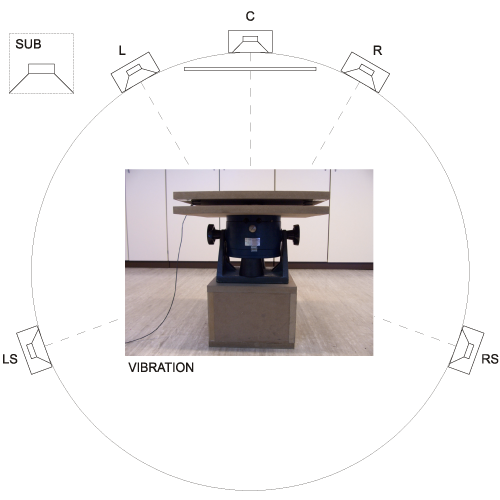 The Influence of Vibrations on Musical Experience, in Journal of the Audio Engineering Society, 62(4), pp. 220-234.